It is difficult to think of a political concept that has been as impoverished by decades of neoliberalization as “the commons.” It is has been almost four years since approximately three decades’ worth of market deregulation culminated in the worst economic crisis since the Great Depression, and aside from the initial reverberations of a global occupation movement, centered in Wall Street, there seems to have been very little recognition that the health of any society should be measured from the ground up, not the top down. Instead, that unique brand of shortsightedness peculiar to capitalist development continues unabated as the profitability of transnational financial institutions continues to take precedence over the general welfare. Pensions, education and health care are everywhere slashed in order to maintain the best environment for the source from which all that is good in the world issues, capital investment. More often than not, it seems as if the only form of the commons that has retained its force in today’s political environment is that particular “common sense” that reduces the heterogeneity of our social and political existence to the narrow metrics of the market. Yet it is precisely in reaction to this ongoing state of affairs that the commons has re-emerged in recent years as a defining concept across a wide field of social struggles. Whether enunciated in the context of economic justice, environmental sustainability, anti-militarism or internet freedom, the overarching applicability of the commons as a tool of protest across diverse fields of struggle suggests a greater collective protest that extends beyond the critique of economic privatization and exploitation: the importance of a reinvigorated notions of the commons is evidence of a more profound rejection of all forms of power that thrive in the multifarious spaces of social, political, economic and cultural partition. It was in recognition of the increasing importance of the concept of the commons within the contemporary political vocabulary that Banff Research in Culture (BRiC) chose the commons and the experience of “being-acting-feeling together” as the theme of its inaugural 2011 residency program. Over the course of the month of May, 2011, a wide range of academics, artists and activists specializing in diverse fields of study and interest gathered in the serene environment of Banff National Park, Canada, in order to contribute to a renewed dialogue on the contemporary importance of the notion of commons. To paraphrase the timeliness of this intervention as articulated by the organizers of the residency program – Imre Szeman, Heather Zwicker, and Kitty Scott – the necessity of re-thinking the commons was drawn from the collective astonishment that a post-2008 global capitalism could continue to draw ever more elements of social life into its profit logic, despite the mounting evidence of its inability to adequately represent – or even recognize – the vast heterogeneity of values that constitutes our shared social reality. A recurring theme of the seminar was therefore the necessity of moving beyond the typical registers in which value, wealth, recognition and relationality currently circulate in order to consider more inclusive and transformative means of both expressing and activating the vitality of the commons. In collaboration with the seminar’s three visiting faculty – Pedro Reyes, Michael Hardt, and Lauren Berlant – the participants of the inaugural BRiC residency were thus encouraged to let go, if only momentarily, of the dominant modes of thinking, being, acting, and feeling that normally shape the terms of our contradictory participation in capitalist society in order to experiment with new and expanded ways of remaking the commons. If the individual and group contributions that make up this special edition of Reviews in Cultural Theory are concerned with a wide range of social, cultural and political contents, they nevertheless share a common conviction, fostered collaboratively during the BRiC residency program, that the commons must not be imagined as a past instance of harmony to which we must return, but rather a future-oriented social form that must be actively produced. Unfortunately, the conceptual framework in which the commons is often articulated tends to interpellate the commons, if only implicitly, as a primordial or natural state that more resembles a collection of mute or inert structures found in the absences of negative power rather than a dynamic and positive force in its own right. This approach to the commons is especially prevalent when it is defined with reference to what Marx referred to as primitive accumulation – the process in which pre-capitalist social forms are annexed and colonized by an ever-expanding and highly mobile capitalism – such as is found in the program summary of the BRiC residency itself: “harkening back to the displacement of people from shared communal spaces and their transformation from public into private property—a central act in the development of European capitalism in the 18th and 19th centuries—the commons insists on the fundamentally shared character of social life.” While the histories of primitive accumulation and the continued realities of accumulation by dispossession should always inform contemporary notions of commons, such anachronistic instantiations of the commons always run of risk producing a notion of the commons that functions more like a fetish object than a truly generative political concept. The initial exchanges of the BRiC residency program thus seemed to come to the early consensus that our considerations of the commons over the course of our limited collaboration must extend beyond the usual academic exercise of negation and critique in order to rethink and remake the commons with an active or positive cadence. It is not enough, it was collectively held, to engage in a critique of the present in the hope that a natural state of commonality would, in and of itself, emerge in the negative spaces we had all so expertly opened in the edifice of neoliberal capitalism; rather, the importance of the commons for creating new modes of being-acting-feeling together, within or alongside the negating logic of capitalist accumulation, demands a mode of political engagement that prefers to err on the side of the affirmative and the positive rather than cling to the relative safety of the negative. It was in this conviction that the discussions that animated the inaugural BRiC residency found its collective voice, and it is from this shared discussion that the following contributions articulate their respective projects for re-making the commons today. 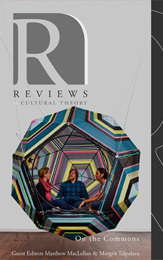 The contributions to this special issue of Reviews in Cultural Theory illustrate the diversity of BRiC participants’ viewpoints, both as points of departure for rethinking the commons in a positive framework, and as proposed alternatives to the negativistic void created by incessant critique. Is there love in the commons? Whether you think you know or haven’t made up your mind yet, this conversation between Michael Hardt and Lauren Berlant, spurred on by Heather Davis’s and Paige Sarlin’s questions, will perhaps move you to rethink the importance of love for the commons. Does love have a potential for social change? What is its relationship to sovereignty? Love thus becomes a starting point in this dialogue between the two theorists for an intellectual journey which touches upon political economy, a#ect, the possible relationships between the human body and the social one, nature and human nature, the roles of pedagogy and imagination in democracy, among many others. Just like their respective works, this sparkling conversation can lead one in as many theoretical directions as there are understandings of this complex concept. Sarah Banting invites us for a walk around Vancouver, and prompts us to ponder how communities emerge within the familiar and the non-familiar. Any verbal exchange, she argues, instantiates a type of relationship, leading to a certain “common ground.” The performative nature of such exchanges—in which knowledge about a place can be viewed as valuable currency, or some type of property—can also lead us to understand the formation of commons. Banting uses the example of theatre to illustrate her points, showing how a performance in Vancouver’s Downtown Eastside can trace the emergence of different groups, each with its own claim to knowledge and familiarity, in the process of negotiating the relationship between themselves and between themselves and place. Aileen Burns and Johan Lundh question the necessary imbrication of contemporary life with capitalism and set out to identify other “terms of belonging” in the world, of relating to one another and consequently of understanding the world in other ways than through neoliberal capitalism. Discounting the possibilities of nationalism to create community, Burns and Lundh turn to alternatives imagined by artists’ groups with which they collaborate. The two curators contextualize the “Terms of Belonging” project within a brief history of artistic engagement with social change, before proceeding to present in detail the various pieces comprising it. By ending their essay with a short manifesto of sorts, Burns and Lundh call for future socially engaged projects in order to envisage alternatives to the present categories of belonging. The Edmonton Pipelines—a group of researchers comprising Russell Cobb, Mo Engel, Daniel Laforest, and Heather Zwicker—are interested in modalities of understanding, narrating, and mapping contemporary life within the “flux” of urbanism, a flux that colludes with neoliberal capitalism and transforms cities in novel ways. Positing that one can no longer understand urban experience as linear, in view of the multiple technologies mediating it, the Pipelines take Edmonton as case study for their research, which aims to reveal the conceptual richness and actual complexity of contemporary urbanism. The researchers are also very thorough in describing their novel methodology, one that intersects traditional theory and close reading from the humanities with demographic and other kinds of data made available by the city. Their thoughtful research manifesto details three sample projects (pipelines), before concluding with the connections between them and the commons. A group of inclusions in this special issue present statements from artists participating either in BRiC’s “On the Commons” or the joint residency of “La Commune. The Asylum. Die Bühne.” Adam Katz presents a few examples of his conceptual poems. In “Trace,” Ayesha Hameed muses on the origins and meaning of collaborative projects for herself in parallel with Walter Benjamin. Eleanor King and Henry Adam Svec express their understanding of the Commons and of the joint Banff residencies in a song and an accompanying essay, which touches on the role of authenticity, aesthetics, and utopian ideas in such endeavours. Similar to Hameed, Elske Rosenfeld’s “Je ne rentrerai pas” parallels her own experience in the last moments of East Germany in 1990 with the experience of a woman striker in 1968 France, who refuses to re-enter the factory, even after the strike has been called off, to underline how the event can open up possibilities for resistance. Leanne Zacharias details her own presentation/performance at BRiC, as well as the reactions that some participants experienced, in order to illustrate how a participatory performance can enact a commons out of its audience. Eddy Kent articulates the concept of time, academic labour, and social capital to demystify the contemporary situation of the academic position. Kent critiques the application of notions like productivity to the academy and probes the contradictions inherent in an institution of learning which values research at the expense of teaching. Echoing King and Svec, Kent also muses on the utopian possibilities emerging at BRiC and how they might work to counteract the neoliberal logic that has long since pervaded the academy. Imre Szeman’s essay ponders the concept of the commons by bringing together ideas from both his latest book, After Globalization, co-authored with Eric Cazdyn, as well as from the public lecture he presented at BRiC. In the aftermath of the 2008 financial crisis, Szeman turns to a critique of Paul Krugman’s modest propositions for the system following globalization. Szeman charges Krugman’s appeal to conscience with an effective transformation of “globalization into a moral problem,” putting the onus for change on the individual, rather than the system. Ultimately, Szeman turns the problem on its head, calling for a revisioning of the role of conscience within left politics. Speaking from a different academic and professional position, Paige Sarlin proposes the concept of “vulnerable accumulation” to cover a variety of intellectual situations in the context of neoliberal capitalism. Starting from Marx’s “primitive accumulation,” Sarlin envisages no less than sixteen definitions of “vulnerable accumulation” operating in the aftermath of the 2008 financial crisis, and which combine the political, the economic, and the affective, and their articulation to the commons. Cayley Sorochan investigates the capacity of flash mobs to create a new type of commons by tackling various examples, from the 2010 voting flash mobs organized on Canadian university campuses, to French apéro géants, and other types of youth subcultures. For her part, Ashley Wong presents attempts by young artists, academics, and activists in Britain to create alternative creative economies to the ones promoted by neoliberal capitalism, especially in view of the cuts imposed by the Cameron government to arts programs. Wong details the activities organized by the DOXA research collective to bring together people from different professional and artistic backgrounds in order to create new approaches to culture. Christine Stoddard and Tess Takahashi explain the coming-together of several BRiC participants through movement. They detail how, drawing on their experiences in contact improvisation, they organized several sessions in which they invited the BRiC participants to explore movement through variously directed exercises. The authors show how the various types of movement enabled the creation of a commons through the negotiation of trust, leadership, attention, communication, and ultimately, interaction of bodies in a given space. While the diversity of these contributions reflect the multiple concerns and interests of the participants of the 2011 Banff Research in Culture seminar, their collection within this document is motivated by the conviction, generated during the seminar, that the vitality of the commons as a political concept will depend on the capacity of the commons, in its many differing iterations, to be productive rather than reductive. This special edition of Reviews in Cultural Theory thus seeks to contribute to an ongoing dialogue on the importance of a renewed understanding of commonality that challenges the negating political ethos of austerity, precarity, and partition and offers alternative ways of being-acting-feeling together.